Before our rainy season hit, I wanted to update some photos of our bedroom with a new piece I added in recently. This summer, I stumbled on this fantastic wicker trunk. I found it at a local thrift shop, and I approached it with a certain amount of skepticism as to what the price tag would read. It seems like some thrift shops forget that they are a thrift shop, and not a retail store. I about passed out when I saw the price tag of $25. I ripped that tag off so fast, it would make your head spin! It is humongous, and it was very hard to find a spot to place it. It has some great features on the lid, so I didn't want to use it as a table, and cover up those spots. 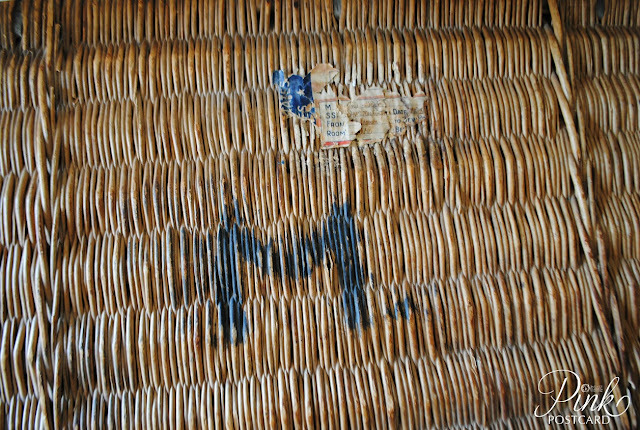 A painted monogram, and a worn shipping label. Honestly, I hope that in showing this piece, someone can give me a better idea of where it originated, if it is in fact, French (! ), and some general history. I haven't found much online. It looks like it has a U.S. shipping label. I love the hand writing that is still visible. The bottom of the trunk has wooden runners. It is a prized piece! 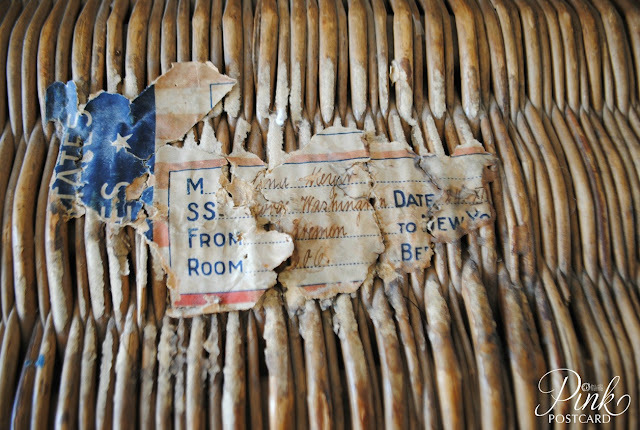 I really try to not keep the stuff I find when I am out scouting. But I knew I would never find a trunk like this again, for that price. 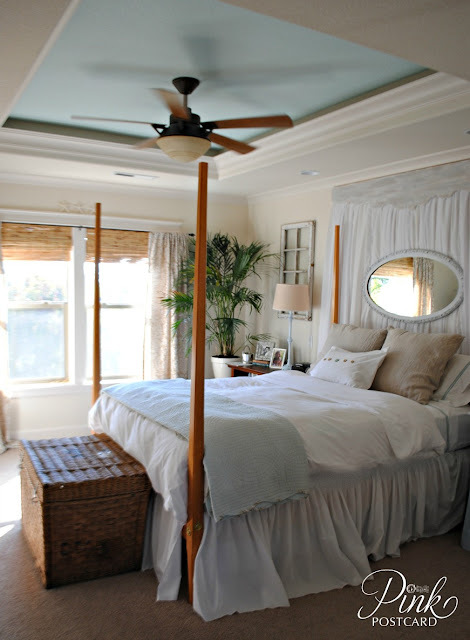 It was funny to open up my Pottery Barn catalog and see their version of it this summer! I am so excited to be adding in some character pieces to our home. Especially when they serve as extra storage! 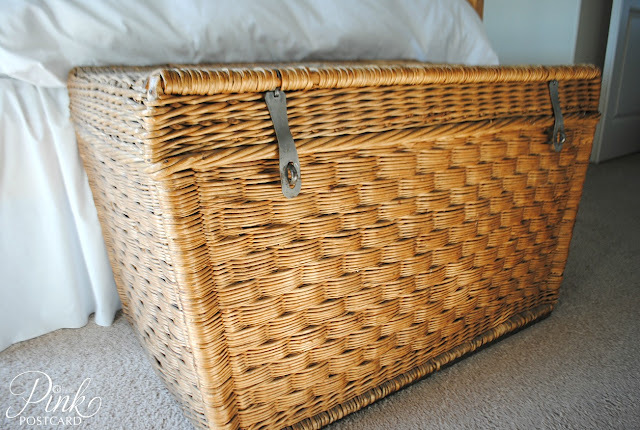 Do any of you know anything about these wicker trunks?? I would love to know more about them and where they originated from! 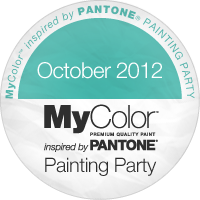 Thank you so much for all of your comments on my projects for the My Color inspired by Pantone Painting Party last week! Tuula @ The Thrifty Rebel! I will be emailing you shortly to get your info so My Color can send you your colors! On a more serious note, no matter what I had planned to post today, it just seems trivial in light of our weekend. 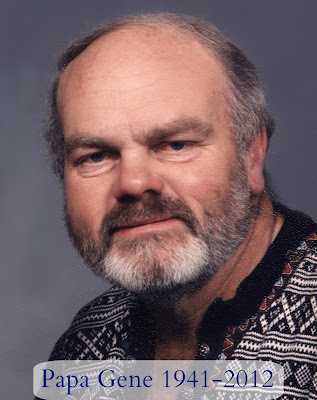 If you read my Facebook page, then you already know that my father in law passed away Thursday. I found out just after I had posted the vanity project. It hit me hard- you just never expect to get the phone call that someone you care about, is suddenly gone. We had a good weekend- despite the circumstances- looking through family photos, seeing words of sympathy in cards, flowers, and on Facebook messages. Recalling our best memories of Gene. Even though we were stunned at his sudden passing, it is hard to be too sad, because we know that he is with his Savior in heaven. Gene had been wheelchair bound since 2006. He had a brush with death in that year, and we said our goodbyes then, thinking we might not see him again. He took great joy and amusement hearing our sorrow, love, and "goodbyes", after a miraculous recovery. He already knew how much he would be missed when he left this earth. Life will not be the same without him. His presence was felt at every baseball, softball, basketball, choir, orchestra, soccer, and volleyball game. I was always amazed that he and Peggy came to every show I've done over the last 2 years. He was a wonderful father in law to me, and I am grateful that I had such an amazing man in my life. 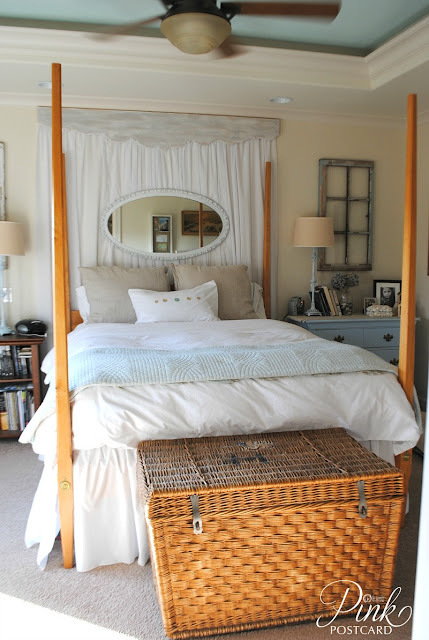 the trunk is awesome and so perfect for your space! i am so sorry for your loss, denise- thinking of your family! what a sweet note about your father in law. i rejoice with you that he is in heaven. it is so much easier knowing that our sorrow only lasts for this lifetime. may the Lord's grace and peace rest on your family during the next many weeks. 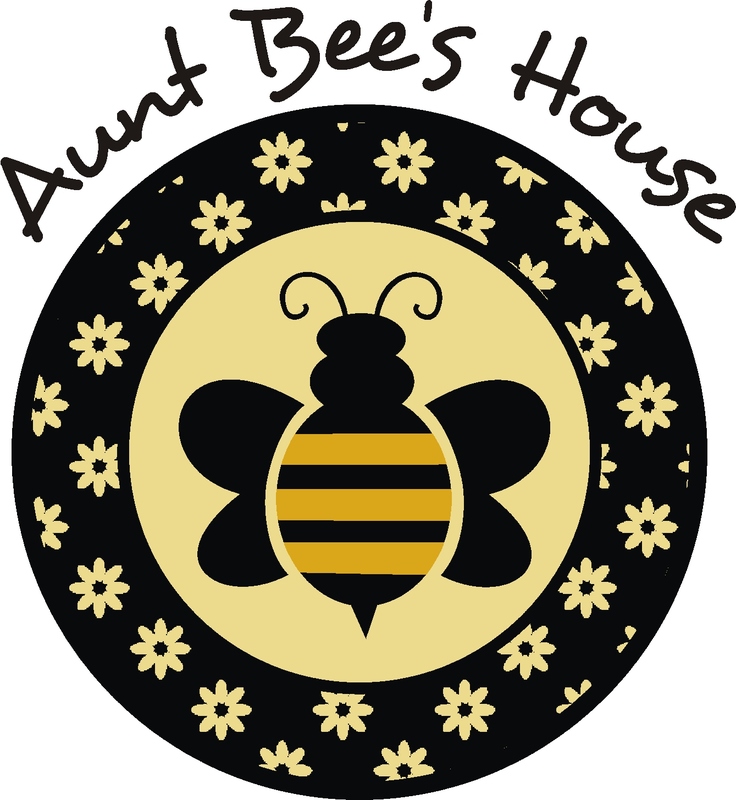 My grandmother was an antiques dealer who did much of her shopping in Europe. 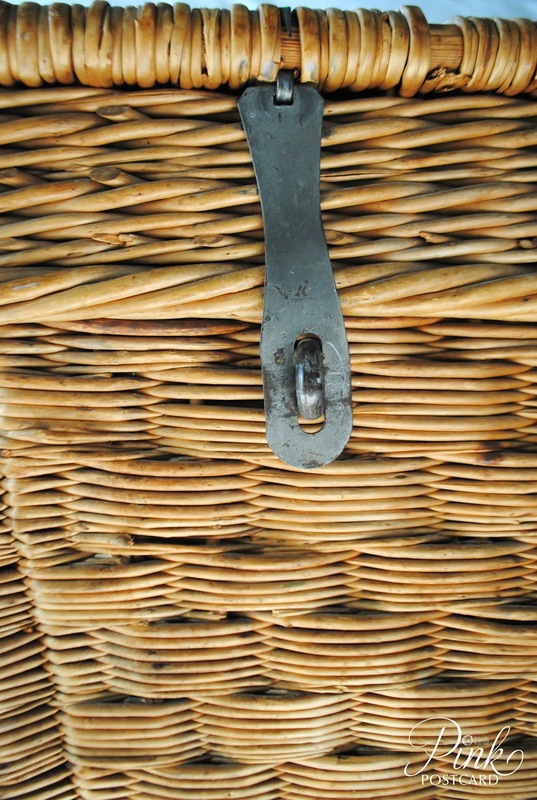 She referred to one of these as a "luncheon hamper" which would have been strapped to the back of a carriage for a day in the country. Sorry sorry to hear of your loss. Denise very sorry for your loss. I will keep you in my thoughts. So sorry to hear about your father-in-law. May the memories comfort you and your family. Awwww, your father in law has the sweetest face... i know you will all miss him. And, your basket is wonderful, what a great find. I agree with you on the thrift shop over pricing stuff too... you were so lucky to find this at a reasonable price! I love that trunk...$25.00 yes, a GREAT buy!! 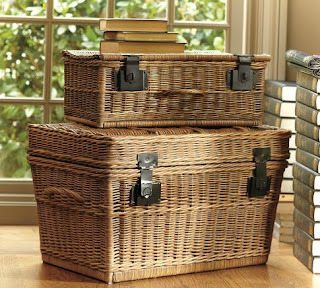 I love the wicker trunk! Denise, I'm so sorry for your loss. It sounds like you have some wonderful memories of your father-in-law. That trunk is an amazing find. I would have snapped it up too. Thanks so much for the giveaway. I'm so excited to try these paints. Just stumbled across your blog and your trunk caught my eye. I have a very similar one that I purchased off Craigslist last month for $30.00 yup I too jumped on it as soon as I saw the photo of it because I knew what a steal it was. The woman I purchased it from said she had gotten it at a yard sale in Germany in the 70's. I am still trying to find a place to put it, since it is huge. But I absolutely love it!